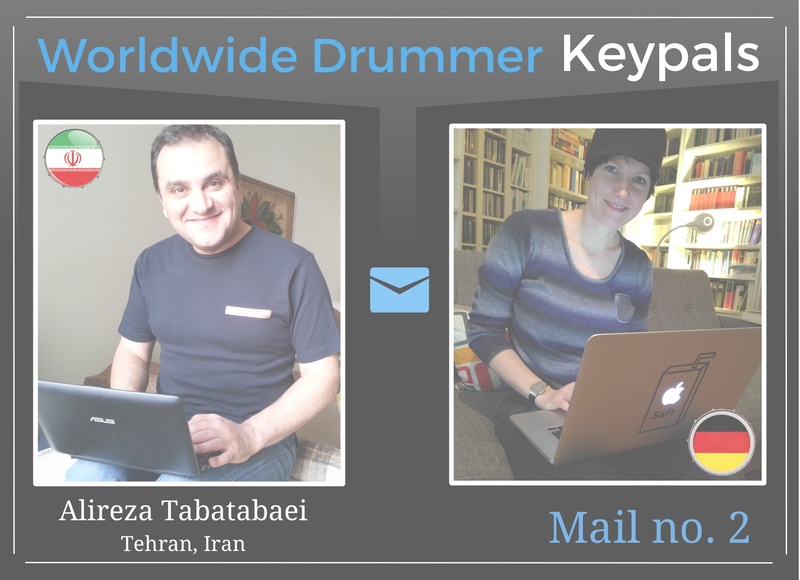 Did you read the first e-mail exchange between my keypal Alireza Tabatabaei and CAT with HATs? Well, there is more. Find out what’s worse: loud music or the flue gas of a car, what it means to be a professional musician in Iran and much more. The first question that popped into my mid was: How in the world is it possible, to hide a drum set from the morals enforcers? A trumpet with a damper, yes, but a drum set? What about your neighbors, they must have known? If they did, they kept quiet about it and didn’t give you up to the police? The second thing I stumbled about was the name of your band: „Arian Band“. That’s probably because I am German. My subconsciousness quickly translated the English word „Arian“ into the German word „Arier“, which is very loaded with history. I think the roots of the words are the same. Does „Arian“ stand for „the noble“ / “the pure“? You told me about your band and all the happy and sad stories. How come you were allowed to tour the world, but also were banned from working? Why did they beat you up? Did you ever think about staying in a foreign country while on tour? Just like some band members of the Cuban band Irakere did. How free were you in your work? Speaking of your band, you wrote that you did work together for 15 years. What happened? Did the band dissolve? 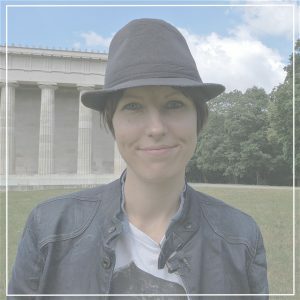 What are your current band projects? Do you still have time to play besides all that teaching and organizing? And is it even possible to make a living as a drummer / musician? If so, you are living in Tehran, how about smaller places, 1000 kilometres away? I find it quite admirable what you have done for the Iranian drum scene. Congratulations on fulfilling your dream and now that of many others in your country I assume. I raise my hats to you! Can you tell me something about your students? Who can afford lessons? 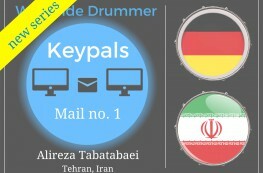 Who are their idols, drummers from Iran, Germany, the USA? How easy is it for them today to get a hold of drum gear? And very important, is there a live scene in which musicians can publicly play their instruments? Of course I am also very curious about female drummers. 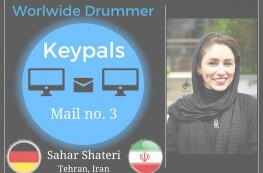 But those questions I will ask to a female drummer from Iran very soon. Last but not least, you will be at the Musikmesse! I cross my fingers for you students and hope everybody, who applies for a visa will obtain one. And then we can all meet in Frankfurt, for I am planning to got there, too. Wonderful! good to hear from you. Another weekend, time to answer your e-mail. It’s actually fun for me to live through old memories again. Today I received the wonderful news that all four of my music pals received a visa to go to Germany. 🙂 I am really looking forward to meeting you at the Musikmesse. So, as you know, necessity is the mother of invention. Back then my drums made it through customs within a chest freezer. 🙂 After that I always hoped for not having to transport it too often. But when I had to, I had to choose the time of the transport very carefully. The early mornings, when the morals enforcers were not out on the streets yet, were best. I covered my drums in a big blanket and put them into my car. That always got them and myself to the destination safely. Generally I must say that people in Iran do love music. One really has to distinguish between the government and its rules and the people, who live here. I was never really worried about neighbours blowing a whistle on me. Only with the pious ones, those with full beards usually, you needed to be careful with them. Back then we covered a lot of Metallica and Megadeth. The five paying viewers plus our friends really had a fling: underground headbanger’s prom. On the other hand, there have been times in which we weren’t allowed to jam for six months only because of a complaint of a bearded neighbor. That was really depressing. In Farsi the name “Arian” means Iranians. I find it very interesting that you mentioned that. As far as I know and found out, it’s been pure propaganda to combine these two words. It goes back to World War II, when Shah sympathized with the Nazis. The Germans back then built a railroad between South- and North Iran, mainly following their own interests. They lived in a southern district of Tehran, which is still called “Nazi Abad”, meaning village of the Nazis. There has been a lot of propaganda to range the Persian “Aria” with the German “Arier”. When I returned home from Germany I was also very irritated, when I saw the Hakenkreuz in the rooms of some young people, who also worshipped Hitler. Apparently they did so, because due to the propaganda, who made them believe that they belonged to the German race. There are still people around, who follow those beliefs blindly. Well, as an artist one gets easily instrumentalized, so did Arian Band. When there were riots for example, we got called to play a concert – as a kind of safety valve. The concerts abroad served as a window, to show the world that in Iran we have pop bands and female guitar players as well. Whenever we went on tour in foreign countries, somebody from the ministry of education and cultural affairs accompanied us. We covered his costs and he made sure that we stuck to Islamic provisions: no alcohol, no pork and so on. For me it’s never been an issue to stay in a foreign country, even though I grew up in Germany, yes. But when we toured there for the first time in 2004, on the last evening our bass player vanished. Upon our return to Iran, we were banned from work for one year. Another time we had an inland concert. Right afterwards the morals enforcers beat us and our fans, who had waited backstage to get some autographs and pictures, up. And that in spite of the police standing there to protect us. They were so powerful, they could just ignore the laws. No, we’ve never been very free in our work. Censorship was a daily business. Movements of any kind were prohibited. Neither we as pop / dance music artists, nor the audience were allowed to move, we had to stay in one spot. Nowadays it’s looser. I often get invited to concerts by former students. Some of them play with newcomers in the pop scene. And when I am there, I am thinking that we were the groundbreakers for them. But they dress as they like. We were only allowed to wear black and no jeans. I wasn’t even allowed to wear a headband, preventing the sweat from running into my eyes. So what ever happened to Arian? Pop records are similar to daily newspapers. For its fifth album Arian Band had to fight and wait three years to receive an approval from the ministry of education and cultural affairs. And after such a time naturally songs aren’t that up to date anymore. Years ago it wasn’t such a big deal, but today with social media and everything, it’s the death warrant for any musician. Every record needs approval from the ministry. The better the connections, the shorter the wait. The closer one is to the centre, the faster one can move on. And it doesn’t take much imagination, that the chances for a band with girls and clean-shaven boys were not so good. When we started Arian, the background singer was 18 years and the youngest, I was the oldest with 28 years. Of course we were happy to have been allowed playing in public. In order to do so, we ignored all difficulties, like being cheated of lots of money by our manager, and did everything for a concert or a tour. But we all got older. In addition the keyboarder and the singer emigrated to the USA and the singer to Australia. It’s a shame that the circumstances don’t allow us to be artists in our own country. However, we still do have many loyal fans. These days I am playing with my underground band “Zappas”. We are not approved, nor will we ever be. We all know that. We would get in trouble with the state. We are not allowed to perform in public or record – complete underground action. Sometimes we get invited to parties by friends and play there. Since we play music in a kind of funk/dance style, we are pretty popular. Hence we need to be really careful not to be caught by the morals enforcers. However we do rehearse three times a week and have a heck of a time. Outside the capital of Tehran it is even harder to be a musician. I receive a lot of e-mails from drummers, who live 1000 kilometres away. Often they sound rather desperate. I am trying to raise their hopes, so they won’t give up. One just needs to believe in oneself and must never give in. With a bit of luck, everything will be fine. 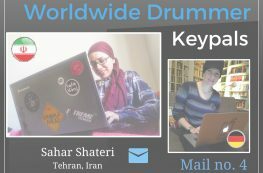 My students and the people of the Iranian Drummer Community are all middle class and upper class people from all over Iran. The young generation is very educated and is very connected through the internet. Nowadays one can’t score with old methods – one needs to be up to date, one needs to be familiar with the latest trends and inventions. Their idols are mainly US drummers. For my part I am trying to bring European and German drummers nearer to them. Of course there are many excellent drum coaches in Germany, whom I can invite and do. But unfortunately the USA are our state’s archenemy. Therefore US citizens are not allowed to enter Iran. For three years I am trying to get the Global Drumming Ambassador Dom Famularo to Tehran. In vain so far. On the one hand that’s ridiculous, for my whole family, parents and siblings, live in the States for more than 15 years. But US citizens can’t visit. We are all hoping that things will be changing into the right direction here soon and relationships will get more normal – especially after the agreement with the West and after the current general elections. On the other hand there are many good Iranian drummers. Also in the smaller cities are young talents, who can compare with some of the best in Europe. Through various events Iranian Drummer tries to bring those people to daylight: play along festivals and drummer meetings. There they get the chance to be heard and seen. These days it’s very easy to buy a drumset and accessories. In comparison to the US or Europe they are indeed a little overpriced, but almost everything is available, everything a drummer’s heart can wish for. There are authorized distributors of many common brands of drums, cymbals, sticks and drumheads. I am a proud endorser of Mapex Drums and Meinl Cymbals. As you can imagine, brands like dw and Zildjian can’t be bought here, for they are from the US. I am looking forward to personally get to know you at the Musikmesse in Frankfurt 2016.